Smack-bang in the heat of summer, a slew of new vegan ice creams have entered the market. Magnum, Ben & Jerry’s, Cornetto, Blue Ribbon and Weis have all had a hand at creating healthier alternatives of Australia’s favourites. In response to rising health trends and dietary options, both Magnum and Cornetto have released vegan ice creams. Dietitian and nutritionist Susie Burrell said: “Consumers are looking for food options that are healthier, lower in sugar, fat and carbs, at the same time we are also a nation of ice cream lovers”. 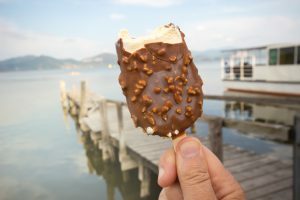 “The availability of the new range of ice-creams means that Aussies are now given a wider variety of options to suit their dietary preferences,” Ms Burrell said. The vegan Magnums are available in two flavours including Dairy Free Classic and Dairy Free Almond and are both made with plant-based vegan ice cream. The Cornetto Vegan Vanilla range is made with vegan chocolate, soy vanilla ice cream and has a hazelnut topping. They’re available at select petrol and convenience stores, as well as supermarkets.